32 of our research papers have now been peer reviewed and published by some of the worlds top scientific journals. In 2013 we submitted no less than 17 scientific research papers or posters Our first in 2014 was available on the 2nd January, and 15 were published in 2014. All have been peer reviewed, accepted and published in prestigious scientific journals or immunology conferences. One is on the front cover of the prestigious scientific journal Oncolmmunology, and our paper on GcMAF and cancer cell apoptosis is in the top 5% most read scientific papers of all time. In the autumn of 2014 the scientific team led by Prof Marco Ruggiero, Director of Science at Immuno Biotech, published and presented at prestigious conferences, 9 peer-reviewed scientific studies that demonstrate a plethora of effects of GcMAF in vivo and in vitro. Many of these biological effects of GcMAF had not been described before and they represent an epochal breakthrough in the field of immunotherapy of cancer and other diseases. 1. 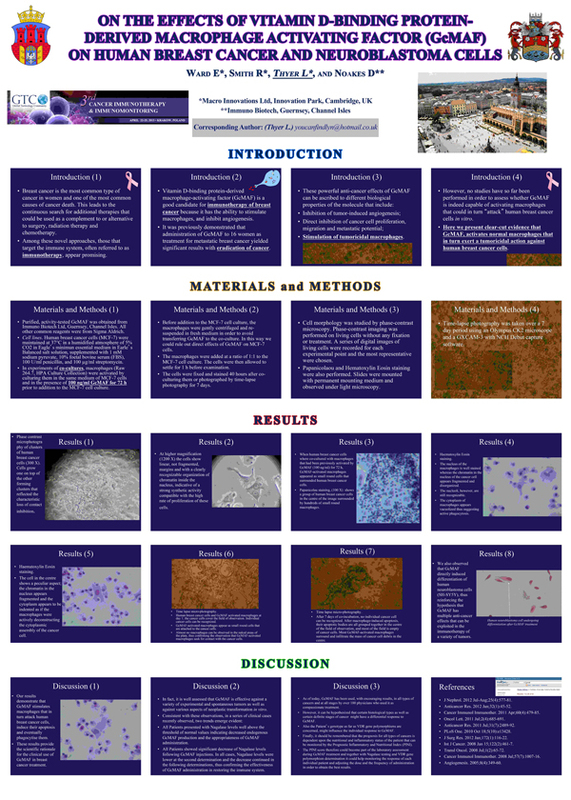 Four peer-reviewed papers describing the results obtained in vitro as well as results of The Swiss Protocol by Marco Ruggiero in clinical cases, have been accepted for publication and presentation at the 9th International Conference of Anticancer Research held at Porto Carras, Sithonia, Halkidiki, Greece, 6-10 October 2014. These papers are published in a special issue of Anticancer Research, which is distributed to registrants during the Conference, as well as to all subscribing libraries and indexing services (print and online through the Stanford University HighWire Press). The International Institute of Anticancer Research. Marco Ruggiero, Jacopo J.V. Branca, David Noakes, Massimo Gulisano, Gabriele Morucci, Lynda Thyer, and Stefania Pacini. OLEIC ACID/DEGLYCOSYLATED VITAMIN D-BINDING PROTEIN SUPPRESSES HER2 ONCOGENE EXPRESSION IN HUMAN BREAST CANCER. Anticancer Res. 34(10): 5845-5847, 2014. Lynda Thyer, Jacopo J.V. Branca, Margit Taubmann. CLINICAL EXPERIENCE OF IMMUNOTHERAPY BASED ON OLEIC ACID BOUND TO GLYCOSYLATED VITAMIN D-BINDING PROTEIN IN LOCALISED AND METASTATIC ADENOCARCINOMA OF THE PANCREAS. Anticancer Res. 34(10): 5847-5849, 2014. Jacopo J.V. Branca, Stefania Pacini and Marco Ruggiero. FOCUSSED TRANSCRANIAL ULTRASOUNDS: APPLICATION TO THE DELIVERY OF GLYCOSYLATED OLEIC ACID/VITAMIN D-BINDING PROTEIN TO BRAIN TUMOURS AND METASTASES. Anticancer Res. 34(10): 5844-5845, 2014. In the first of these studies it is described for the first time in history the eradication of a major oncogene (HER-2) in a breast cancer patient whose breast cancer was eradicated following The Swiss Protocol. In the second study, the successful approach to metastatic pancreatic cancer is described along with the molecular interaction between oleic acid-GcMAF (OA-GcAMF or Goleic) and a major tumor suppressor gene (p53). In the third study, the successful approach to incurable brain cancer is described along with the the molecular interaction between Goleic and a major oncogene involved in brain cancer (BCl-6). In this study, The Swiss Protocol for brain cancer by Marco Ruggiero, a protocol that involves the use of transcranial ultrasonography, is revealed for the first time. It is worth noticing that this study was performed in collaboration with a major oncology hospital in central London, UK. In all three studies, Prof. Ruggiero and colleagues demonstrate for the first time that the plethora of biological activities observed when treating patients with Goleic has to be ascribed to the presence of intrinsically disordered domains (IDD) in the molecular structure of GcMAF. An IDD is a domain that lacks a fixed or ordered three-dimensional structure. Prof. Ruggiero discovered that GcMAF shows two IDDs, one in the first domain (IDD1), and one in the second domain (IDD2), in the proximity of the oleic acid-binding domain. As shown in the studies, the sequence of the IDD2 shows a peculiar arrangement of hydrophobic aminoacids in the region that binds oleic acid as well as an IDD composed by negatively- and positively- charged aminoacids. Prof. Ruggiero and colleagues also demonstrate, at the molecular level, that the effects observed with Goleic cannot be reproduced with GcMAF alone. This in turn demonstrates that Goleic and not GcMAF is the most efficient molecule to treat cancer as well as a number of other chronic conditions. Another study by our research group demonstrates the effects of Goleic in multiple myeloma cells in vitro. Anticancer Res. 34(10): 6175-6177, 2014. These data are consistent with clinical observation demonstrating a therapeutic effect of The Swiss Protocol in multiple myeloma patients. It is worth noting that Anticancer Research, where these studies have been published, is an independent international peer-reviewed journal devoted to the rapid publication of high quality original articles and reviews on all aspects of experimental and clinical oncology. Anticancer Research was established in 1981 and the articles published in this journal are regularly indexed in all bibliographic services, including: Current Contents (Life Sciences), Science Citation Index Expanded (Web of Science), Index Medicus, Biological Abstracts, PubMed, Chemical Abstracts, Excerpta Medica, University of Sheffield Biomedical Information Service, Current Clinical Cancer, AIDS Abstracts, Elsevier Bibliographic Database, EMBASE, Compendex, GEOBASE, EMBiology, Elsevier BIOBASE, FLUIDEX, World Textiles, Scopus, Progress in Palliative Care, Cambridge Scientific Abstracts, Cancergram (International Cancer Research Data Bank), MEDLINE, Reference Update – RIS Inc., PASCAL-CNRS, Inpharma-Reactions (Datastar, BRS), CABS, Immunology Abstracts, Telegen Abstracts, Genetics Abstracts, Nutrition Research Newsletter, Dairy Science Abstracts, Current Titles in Dentistry, Inpharma Weekly, BioBase, MedBase, CAB Abstracts/Global Health Databases, Investigational Drugs Database, VINITI Abstracts Journal, Leeds Medical Information, PubsHub, Sociedad Iberoamericana de Información Cientifica (SIIC) Databases. 2. A clinical study in collaboration with a major Italian Hospital (the Hospital of Prato, Division of Nephrology) was accepted for presentation and publication at the annual meeting of the Italian Society of Nephrology in 2014. In this study, the effects of The Swiss Protocol by Marco Ruggiero in kidney disease and in kidney cancer are described. This study represents the very first conducted in collaboration with a major hospital of the Public Health Service. –	Clinical experience of renal carcinoma immunotherapy with oleic acid complexed with deglycosylated vitamin D-binding protein by Aterini et al. 3. Two clinical case reports describing the effects of the Swiss Protocol have been accepted for presentation and publication at the 68th Congress of the The Italian Society of Anatomy. This scientific society is one of the oldest in the world and it was founded in 1929 by Nello Beccari, Luigi Castaldi and Emerico Luna under the auspices of Giulio Chiarugi. The official organ of the Society is the “Italian Journal of Anatomy and Embryology”, in which the proceedings of the annual meeting as an ordinary supplement are published. The Italian Journal of Anatomy and Embryology, which is listed in major databases including PubMed, was made famous by publishing a seminal paper by Duesberg and Ruggiero debunking the AIDS fraud (Ital J Anat Embryol. 2011;116(2):73-92. AIDS since 1984: no evidence for a new, viral epidemic–not even in Africa. Duesberg PH, Mandrioli D, McCormack A, Nicholson JM, Rasnick D, Fiala C, Koehnlein C, Bauer HH, Ruggiero M.). –	Gc-protein-derived Macrophage Activating Factor (GcMAF) induces ERBB2 shift in human breast cancer by Ruggiero et al. (It. J. Anat. Embryol. 119: 1S, 169, 2014). Intra-tumoural nitric oxide release by macrophages activated by Gc-protein-derived Macrophage Activating Factor (GcMAF) by Ruggiero et al. (It. J. Anat. Embryol. 119: 1S, 170, 2014). In addition to these 2 clinical case studies, 2 in vitro studies have been published in the Italian Journal of Anatomy and Embryology describing the effects of Goleic in human neurons and microglial cells. These studies demonstrate that Goleic eliminates the toxic side effects of chemotherapy. –	Human and murine microglial cells: to experimental models to deeply understand the mechanism of microglia involvement in human brain diseases by Branca et al. (It. J. Anat. Embryol. 119: 1S, 21, 2014). Gc-protein derived macrophage activating factor (GcMAF) counteracts the neuronal damage induced by oxaliplatin by Morucci et al. (It. J. Anat. Embryol. 119: 1S, 135, 2014). With these new 9 studies, we have published so far 15 studies in 2014. –	2014. A New Methodology of Viewing Extra-Axial Fluid and Cortical Abnormalities in Children with Autism via Transcranial Ultrasonography. Bradstreet JJ1, Pacini S2, Ruggiero M3. –	Ward, E., R. Smith, J.J.V. Branca, D. Noakes and G. Morucci et al., 2014. Clinical experience of cancer immunotherapy integrated with oleic acid complexed with de-glycosylated vitamin d binding protein. Am. J. Immunol., 10: 23-32. –	Oleic Acid, deglycosylated vitamin D-binding protein, nitric oxide: a molecular triad made lethal to cancer. Ruggiero M, Ward E, Smith R, Branca JJ, Noakes D, Morucci G, Taubmann M, Thyer L, Pacini S. Anticancer Res. 2014 Jul;34(7):3569-78. Healing the Symptoms Known as Autism – 2nd Edition Paperback – January 8, 2014 by Kerri Rivera (Author), Kimberly McDaniel (Contributor), Daniel Bender (Contributor), Jim Humble (Contributor), Dr. Andreas Kalcker (Contributor), Dr. Marco Ruggiero (Contributor), Robert L. Sands (Contributor). ISBN-10: 0989289044. ISBN-13: 978-0989289047. –	Clinical experience of integrative immunotherapy centred on oleic acid complexed with deglycosylated vitamin D-binding protein by Ward et al. (Abstr. P5.16, pag. 88). –	Increased splenic blood flow following macrophage activation by oleic acid complexed with vitamin D-binding protein by Ward et al. (Abstr P4.20, pag. 81). Two additional peer-reviewed papers are in press in “Anticancer Drugs” and in the “Italian Journal of Anatomy and Embryology”. Prof. Ruggiero also wrote a chapter in a book that should be published by the end of the year and it is announced as a best-seller. In May 2014 two additional studies describing our successful approach to cancer treatment (25% tumour shrinkage per week) have been accepted for presentation after exhaustive peer-review by a prestigious Scientific Committee. The Scientific Committee of the IX National Conference of the Italian Society of Immunology, Clinical Immunology and Allergology, accepted two studies of ours reporting our most recent successes in cancer treatment with Oleic-Acid-GcMAF (Goleic). The dramatic results were presented to an international audience of Medical Doctors and Researchers gathered in Florence, Italy on May 28-31. The Conference was under the Patronage of the European Federation of Immunological Societies, the European Academy of Allergy and Clinical Immunology, the National Federation of the Italian Medical Associations, the Municipality of Florence, and the main University Hospital of Firenze (AOL Careggi). The patronage of such distinguished medical and scientific societies and institutions testimonies the international prestige of the Conference and, consequently, of the presented studies. The first study, authored by Ward, Smith, Branca, Noakes, Morucci and Thyer, describes the successful integrative approach based on Goleic in cancer patients defined as incurable. The actual images of tumours shrinking on average 25% in one week were clearly presented and they received the appreciation of the highly qualified audience. We were particularly proud to show the images of a pancreas adenocarcinoma, one of the most rapidly lethal cancers, that not only shrunk in size, but is eventually became encapsulated, de facto turning into a benign tumour. The other study, authored by Ward, Smith, Branca, Noakes, Morucci, Pacini, Ruggiero and Thyer, describes the molecular mechanism of action at the basis of such stunning results. Here it is demonstrated that Goleic induces the synthesis of a powerful anticancer molecule that is called nitric oxide that in turns kills cancer cells, thus contributing to cancer eradication. With these results, we demonstrate another attack of Goleic on cancer that was not known before. This study is at the basis of a full paper that we aim at publishing in one of the most prestigious, peer-reviewed, scientific journals listed in the database of the National Library of Medicine of the National Institutes of Health of the USA. This paper is probably the most major milestone in autism research. For the very first time in autism history, clearly evident anatomical alterations in the autistic brain can be easily detected, measured and classified. The diagnosis and the follow-up of autism will no longer be based on subjective clinical observation, but on solid, indisputable data. This technique will also allow diagnosis, as early as 3 months of age, the future development of ASD with consequent, significant possibilities to intervene and possibly avoid and/or revert the onset of autism. There is no doubt Transcranial Ultrasonography is a useful screening technique for children at potential risk of ASDs. Since ALL children are now at risk from autism (one in 50 contract it), in our opinion this exam should be performed on ALL newborn babies between the age of 3 and 6 months in order to prevent the onset of ASD. If this exam is performed correctly and on the proper scale, we may surely state that we shall be able to revert the course of this epidemic and prevent the burden of sufferance that you know all too well. Currently there are only two centres in the world where such a technique is practised: Dr Bradstreet’s Brain Treatment Centre in the USA and our own Treatment Centre in Switzerland. Last, but not least, this technique will also allow us to monitor the efficacy of therapies in a very objective and indisputable manner. Dr Bradstreet discovered our first autism breakthrough, namely that our GcMAF is easily the lead therapy in autism: 85% of children improve and 15% made full recoveries, although with Goleic that figure is now 25%. Results: Comparisons of the extra-axial spaces indicated increases in the ASD subjects. For EAF we scored based on the gyral summit distances between the arachnoid membrane and the cortical pia layer (subarachnoid space): 1) < 0.05 cm, 2) 0.05 – 0.07 cm, 3) 0.07 – 0.10 cm, 4) > 0.10 cm. We also defined cortical dysplasia as the following: hypoechoic lesions within the substance of the cortex, or disturbed layering within the grey matter. For cortical dysplasia we scored: 1) none observed, 2) rare hypoechogenic lesions and/or mildly atypical cortical layering patterns, 3) more common, but separated areas of cortical hypoechogenic lesions, 4) very common or confluent areas of cortical hypoechogenicity. Again all of the neurotypical siblings scored 1, while the ASD subjects’ mean score was 2.79 + 0.93. 16 have been produced by Immuno Biotech Ltd.
1. Gc protein-derived macrophage-activating factor (GcMAF) stimulates cAMP formation in human mononuclear cells and inhibits angiogenesis in chick embryo chorionallantoic membrane assay. Pacini S, Morucci G, Punzi T, Gulisano M, Ruggiero M.
Cancer Immunol Immunother. 2011 Apr;60(4):479-85. doi: 10.1007/s00262-010-0953-7. Epub 2010 Dec 14. Here it is demonstrated that GcMAF from Immuno Biotech Ltd is as effective as Dr. Yamamoto’s GcMAF in inhibiting angiogenesis, a key event in tumour progression. 2. Effects of Cadmium and vitamin D binding protein-derived macrophage activating factor (DBP-MAF) in human breast cancer cells. Massimo Gulisano, Tiziana Punzi, Gabriele Morucci, Marco Ruggiero. It. J. Anat. Embryol. Vol. 116, No 1 (Supplement) 2011. Here it is demonstrated that GcMAF counteracts the noxious effects of Cadmium, an ubiquitous heavy metal pollutant involved in autism, chronic fatigue syndrome and neurodegenerative diseases. 1. Effects of vitamin D-binding protein-derived macrophage-activating factor on human breast cancer cells. Pacini S, Punzi T, Morucci G, Gulisano M, Ruggiero M.
On the effects of GcMAF in human breast cancer cells in vitro. GcMAF reverts the neoplastic phenotype; cancer cells become normal and are deprived of their metastatic potential. 2. Effect of paricalcitol and GcMAF on angiogenesis and human peripheral blood mononuclear cell proliferation and signaling. Pacini S, Morucci G, Punzi T, Gulisano M, Ruggiero M, Amato M, Aterini S.
J Nephrol. 2012 Jul-Aug;25(4):577-81. doi: 10.5301/jn.5000035. GcMAF stimulates human monoctyes and the individual responsiveness is dependent upon the vitamin D receptor (VDR) genotype. GcMAF in chronic kidney disease. 3. Cadmium toxicity, with particular regard to myalgic encephalomyelitis/chronic fatigue syndrome; application of transcranial sonography to the study of cadmium-induced neuronal damage. Massimo Gulisano, Gabriele Morucci, Stefania Pacini, Jacopo Branca and Marco Ruggiero. Abstr. International Cadmium Symposium 2012, Sassari, Italy, P. 36. GcMAF counteracts the effects of toxic Cadmium. Relevant for ME/CFS, and the first transcranial sonography paper. 1. Effects of vitamin D3 and paricalcitol on immature cardiomyocytes: a novel role for vitamin d analogs in the prevention of cardiovascular diseases. Pacini S, Morucci G, Branca JJ, Aterini S, Amato M, Gulisano M, Ruggiero M.
Nutrients. 2013 Jun 7;5(6):2076-92. doi: 10.3390/nu5062076. GcMAF increases energy production at the mitochondrial level. These results explain the reported increase of energy observed by patients treated with GcMAF for different diseases. 2. A novel role for a major component of the vitamin D axis: vitamin D binding protein-derived macrophage activating factor induces human breast cancer cell apoptosis through stimulation of macrophages. Thyer L, Ward E, Smith R, Fiore MG, Magherini S, Branca JJ, Morucci G, Gulisano M, Ruggiero M, Pacini S.
Nutrients. 2013 Jul 8;5(7):2577-89. doi: 10.3390/nu5072577. GcMAF activates macrophages that attack and destroy human breast cancer cells. The molecular assembly and mode of action of GcMAF are elucidated. For the first time an interconnection with the vitamin D receptor (VDR) signalling is presented. This paper is in the top 5% of all articles ever tracked by Altmetric. The Altmetric score is one measure of the quality and quantity of online attention that this article has received. Altmetric has tracked more than 1.500.000 articles across all journals so far. Compared to these this article has done particularly well and is in the 95th percentile. 3. Therapeutic effects of highly purified de-glycosylated GcMAF in the immunotherapy of patients with chronic diseases. Lynda Thyer, Emma Ward, Rodney Smith, Jacopo J.V. Branca, Gabriele Morucci, Massimo Gulisano, David Noakes and Stefania Pacini. DOI : 10.3844/ajisp.2013.78.84. http://www.thescipub.com/abstract/10.3844/ajisp.2013.78.84 – the .PDF is on the right. On the therapeutic effects of GcMAF in patients with cancer, autism, chronic fatigue syndrome, Lyme disease, multiple sclerosis, amyotrophic lateral sclerosis. This is the first report on the therapeutic effects of GcMAF in patients with these dreadful neurological diseases. 4. Gc protein-derived macrophage-activating factor decreases α-N-acetylgalactosaminidase levels in advanced cancer patients. Thyer L, Ward E, Smith R, Branca JJ, Morucci G, Gulisano M, Noakes D, Eslinger R, Pacini S. OncoImmunology 2013; 2:e25769; http://dx.doi.org/10.4161/onci.25769. On the therapeutic effects of GcMAF in 20 patients with advanced cancer defined as incurable. Clinical cases of breast, prostate, bladder, ovarian, colon, tongue, larynx, head and neck carcinomas, lymphomas and oligodedroglioma. This paper has been awarded the front cover of the August issue of the Journal OncoImmunology. 5. Initial Observations of elevated Alpha-n-Acetylgalactosaminidase Activity Associated with Autism and Observed Reductions from GC Protein—Macrophage Activating Factor Injections. James Jeffrey Bradstreet, emar Vogelaar and Lynda Thyer. Autism Insights 2012:4 31–38. doi: 10.4137/AUI.S10485. On the therapeutic effects of GcMAF in autism. Autism is eradicated in a significant percentage of cases. About 85% of subjects show improvement following GcMAF treatment. 6. Study of aminoacidic sequences of vitamin D binding proteins involved in macrophage activation. Fiore MG, Magherini S, Gulisano M, Pacini S and Ruggiero M (2013). Front. Immunol. Conference Abstract: 15th International Congress of Immunology (ICI). doi: 10.3389/conf.fimmu.2013.02.01124. 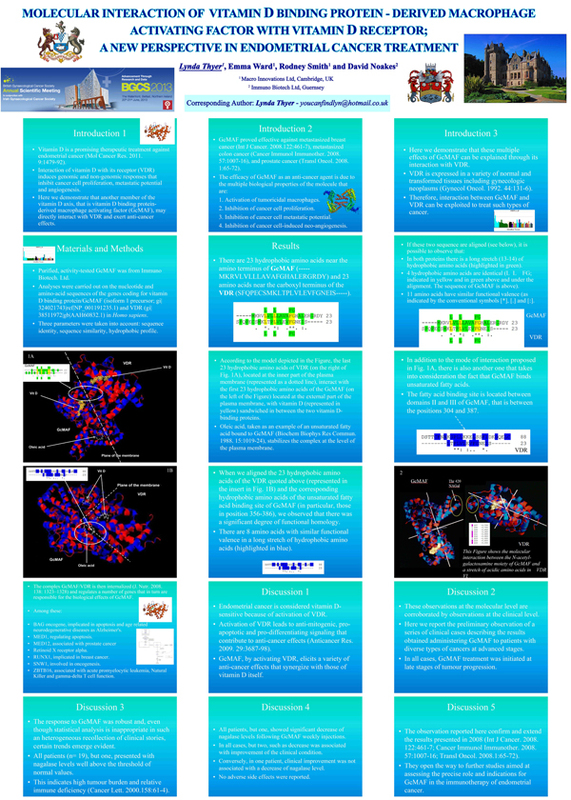 On the physiological molecular assembly of GcMAF. 7. Multifaceted immunotherapeutic effects of vitamin D-binding protein-derived macrophage activating factor (GcMAF) on human breast cancer and neuroblastoma cells. Ruggiero M, Pacini S, Morucci G, Branca J, Ward E, Smith RJ, Thyer L and Gulisano M (2013). Front. Immunol. Conference Abstract: 15th International Congress of Immunology (ICI). doi: 10.3389/conf.fimmu.2013.02.00221. On the multifaceted effects of GcMAF in human breast cancer cells and human neuroblastoma (a brain tumour) cells. Here it is demonstrated that when GcMAF is prepared according to its molecular configuration, it is 100 fold more effective than “regular” GcMAF in destroying human cancer cells. 8. Effects of vitamin D binding protein-derived macrophage activating factor on human neuroblastoma cells and predicted molecular interaction with the vitamin D receptor. M. Ruggiero, M.G. Fiore, S. Magherini, G. Morucci, J.J.V. Branca, M. Gulisano, L. Thyer, S. Pacini. Abstr. The European Cancer Congress 2013. P91-596. Amsterdam, 2013. On the molecular events responsible for the anticancer effects of GcMAF. stimulates proliferation and signalling in a human neuronal cell line. Morucci G, Fiore MG, Magherini S, Branca JJV, Gulisano M, Thyer L, Ruggiero M and Pacini S.
The effects of GcMAF on human neurons explain its therapeutic effects in autism, chronic fatigue syndrome, multiple sclerosis and amyotrophic lateral sclerosis. 10. Treatment and Prevention of Cadmium-induced alterations on human neurons. Morucci G, Branca JJV, Ruggiero M, Gulisano M and Pacini S. (P29). GcMAF has a neuro-protective effect against heavy metal-induced neuronal damage. Implications for autism and chronic fatigue syndrome treatment. 11. A molecular model of the interaction between vitamin D binding protein-derived macrophage activating factor and vitamin D receptor. Fiore MG, Magherini S, Morucci G, Branca JJV, Pacini S, Gulisano M and Ruggiero M. (P50). Italian Journal of Anatomy and Embryology (2013) 118 (Suppl. 2): S89. On the physiological molecular assembly of GcMAF. Its interaction with the VDR signalling is elucidated. The molecular mechanism explaining why GcMAF has so many biological effects with therapeutic implications. 12. Alpha‐N‐acetylgalactosaminidase levels in cancer patients are affected by Vitamin D binding protein‐derived macrophage activating factor. Gulisano M, Pacini S, Thyer L, Morucci G, Branca JJV, Smith R, Wards E and Noakes D. (P85). Italian Journal of Anatomy and Embryology (2013) 118 (Suppl. 2): S104. 13. The immune stimulant properties of vitamin D binding protein-derived macrophage activating factor can minimise morbidity in gynaecological cancers. Smith R.
Abstr. British Gynaecological Cancer Society and Irish Gynaecological Cancer Society annual meeting. P027-92, 2013. Belfast, Ireland. 14. Molecular interaction of vitamin D binding protein macrophage activating factor with vitamin D receptor; a new perspective in endometrial cancer. Thyer L.
Abstr. British Gynaecological Cancer Society and Irish Gynaecological Cancer Society annual meeting. P136-201, 2013. Belfast, Ireland. 15. Immunotherapeutic Effects of Vitamin D-binding Protein-derived Macrophage Activating Factor (GcMAF) on Human Breast Cancer Cells. Ruggiero M, Pacini S, Ward E, Smith RJ, Thyer L, Gulisano M. Multifaceted Abstr. 5th Immunotherapeutic and Immunomonitoring Conference 2013, San Diego, CA, USA. On the effects of GcMAF on human breast cancer cells. 16. On the effects of Vitamin D-binding protein-derived macrophage activating factor (GcMAF) on human breast cancer and neuroblastoma cells. Ward E, Smith RJ, Thyer L, and Noakes D.
Abstr. 3rd Immunotherapeutic and Immunomonitoring Conference 2013, Krakow, Poland. 17. Role of Vitamin D Binding Protein-derived Macrophage Activating Factor (GcMAF) in the immunotherapy of cancer. Lynda Thyer; Rod Smith; Emma Wards; David Noakes. Conference proceedings, II Anticancer drugs 2013. O19-27 Stockholm, Sweden. 18. Group component protein-derived macrophage activating factor stimulates macrophages that induce human breast cancer cell apoptosis. 20. American Journal of Immunology. Effects of GcMAF on human neurons and ME/CFS treatment. Published the 8th November. GcMAF is able to increase the viability and the metabolism of human neurons, and, most important, to induce neurons to establish contact with each other. As it is well known in the field of neurosciences, a decreased connectivity among neuronal circuits is at the basis of most, if not all, neurological and neurodevelopmental disorders. The paper also explains why GcMAF combats pain. or: GcMAF causes cancer cell suicide via macrophages. This is the first published clinical paper since Yamamoto’s on patients, and its peer reviewed and published by the prestigious scientific journal Oncolmmunology, where it made the front page! Here we report on 20 patients, but we have hundreds to report on. Published in the American Journal of Immunology 9 (3): 78-84, 2013 on the 20th August 2013. This is the second published clinical paper since Yamamoto’s on patients. Our last one was published only two weeks ago! The clinical cases successfully treated with GcMAF in this paper include cancer, and for the very first time, ME/CFS, ALS (amyotrophic lateral sclerosis) and MS, multiple sclerosis. 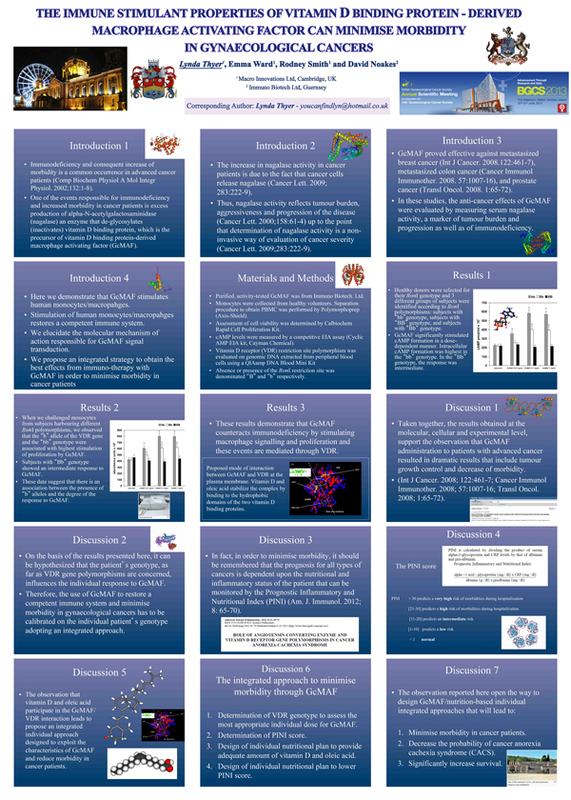 Published in Frontiers in Immunology and presented at the 15th International Congress of Immunology (ICI), Milan, Italy, 22 Aug – 27 Aug, 2013. Each Frontiers article is a landmark of the highest quality, thanks to genuinely collaborative interactions between authors and review editors, who include some of the world’s best academicians. Frontiers is well aware of the potential impact of published research both on future research and on society and, hence, does not support superficial review, light review or no-review publishing models. Research must be certified by peers before entering a stream of knowledge that may eventually reach the public – and shape society. Therefore, Frontiers only applies the most rigorous and unbiased reviews, established in the high standards of the Frontiers Review System. Furthermore, only the top certified research, evaluated through the democratic Frontiers Evaluation System, is disseminated to increasingly wider communities as it gradually climbs the tiers of the Frontiers Tiering System from specialized expert readership towards public understanding. Presented at the 67°th Congress of the Italian Society of Anatomy and Histology, held in Brescia on September 20-22, 2013. This paper has been accepted for publication in the Italian Journal of Anatomy and Embryology, a peer-reviewed journal indexed in the National Library of Medicine of the USA (Gulisano M et al, It J Anat Embryol 118 (S2): 104, 2013). In this study the Authors describe the effects of GcMAF in patients with advanced tumours that include breast, ovarian, prostate, bladder, tongue, colorectal, head and neck cancers as well as lymphoma and oligodendroglioma (a rare brain tumour). The many effects of GcMAF on cancer. Thyer L**, Gulisano M* Published at the 5th Immunotherapeutics & Immunomonitoring Conference January 31st 2013 San Diego, CA, USA. 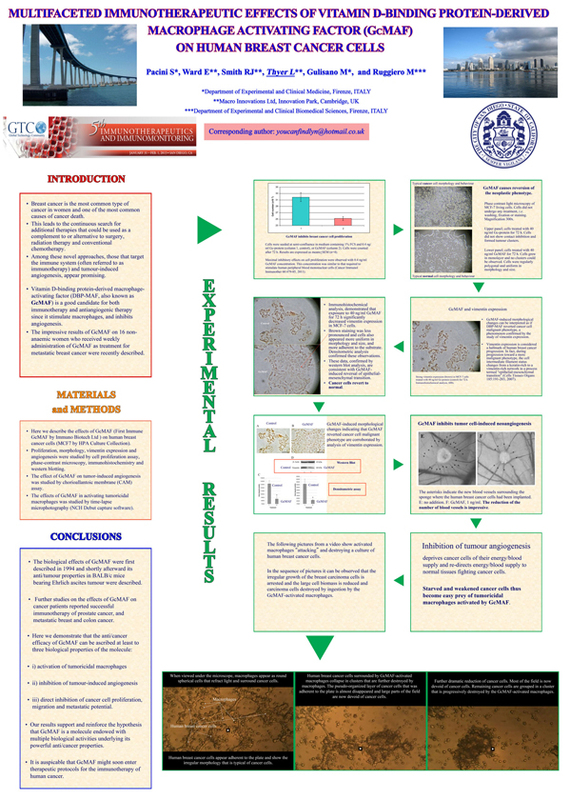 And presented to the International PMTC Cancer Conference at the University of Sharjah UAE on the 1st February 2013. Vitamin D-binding protein-derived macrophage activating factor (GcMAF) is a powerful stimulant of the immune system that has been proposed as an immunotherapeutic agent in the treatment a variety of conditions ranging from cancer to neurological disorders. We previously demonstrated that GcMAF added to human breast cancer cells exerts multiple effects that concur to its antitumor potential; in fact, GcMAF inhibited cancer cell proliferation and metastatic potential, reverted the neoplastic phenotype and inhibited cancer cell-induced angiogenesis, a critical step in cancer progression. In the present study, we describe for the first time the effects of GcMAF on the activation of macrophages that were added to a culture of the human breast cancer cell line MCF-7 (HPA Culture Collection). MCF-7 cells, incubated for 2 days, showed the anarchic morphology typical of carcinoma cells. They grouped in disordered cell masses extending above the cell monolayer that appeared as large lumps of cells protruding upwards. Macrophages (cell line Raw 264.7, HPA Culture Collection) were activated by culturing them in the presence of 100 ng/ml GcMAF (Immuno Biotech Ltd) for 72 h prior to addition to the MCF-7 cell culture. The macrophages were added at a ratio of 1:1 to the MCF-7 cells. The cells were then allowed to settle for 1 h before time lapse photography. Photography was taken over a 60 h period using an Olympus CK2 microscope and a GXCAM-3 with NCH Debut capture software. Un-stimulated macrophages appeared as round spherical cells that refract light. Once activated by GcMAF, macrophages sent out cytoplasmic protrusions that we interpreted as if the cells were trying to seek out and make contact with MCF-7 cancer cells. After about 60 h, it could be observed that the irregular growth of the breast carcinoma cells was arrested and the large protruding cell biomass was reduced. Carcinoma cells were phagocytised by the activated macrophages. Taken together, these results support and reinforce the hypothesis that GcMAF is a molecule endowed with multiple biological activities relating to its antitumor properties.